Buzz Lightyear is at your service with this exciting Toy Story tin that’s ideal for Explorers whether they be toy or child. 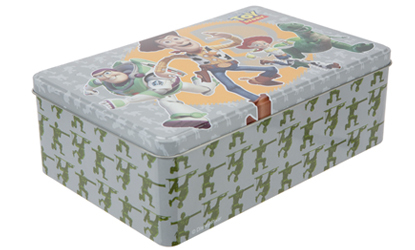 The rectangle Disney Toy Story Buzz Lighyear tin makes a lovely gift idea for kids. Ideal for secret treasures and knick nacks, this Toy Story treasure tin features the ever dramatic Disney Toy Story Buzz Lightyear character! The decorated Disney Toy Story tin shows a full colour dynamic Buzz Lighyear lifting off with dramatic action silhouettes of the brave hero in the background… secret agent style! A lovely little gift idea for kids, you could even put a little something extra in it before wrapping it up!